Ben Simmons and Joel Embiid each post double-doubles and combine for 53 points as the Sixers beat the Raptors, 126-101. Reggie Bullock knocked down a jumper at the buzzer to give Dwane Casey and the Pistons a 106-104 win over the Raptors. Blake Griffin had 30 points and 12 rebounds in Detroit's win. Kawhi Leonard had 26 points and 9 rebounds for Toronto in the loss. Greg Monroe hits the shot before time expires in the second quarter. Gregg Monroe passes to Marcus Morris for the two-handed slam. Greg Monroe spins around his defender and lays it in. 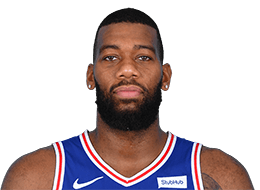 Greg Monroe records his second career triple-double, with 19 points, 11 rebounds and 10 assists off the bench. Shane Larkin throws Greg Monroe an alley-oop off the pick and roll and Monroe finishes with a two-handed slam. Greg Monroe finds Jabari Bird cutting to the basket for a two-handed slam. Terry Rozier zips through the lane to find Greg Monroe for the layup. Eric Gordon scores 29 points and James Harden adds 26 as the Rockets defeat the Celtics 123-120. Appeared in all 82 games (all starts) in his fourth NBA season, averaged 15.2 points, 9.3 rebounds, 2.1 assists, 1.1 steals and 0.6 blocks in 32.8 minutes ... Tied a season-high 28 points vs. Milwaukee (3/31)…Recorded his 300th career game at Philadelphia (3/29)…Tied a season-high five assists at Phoenix (3/21)…Tied a career-high four steals at Denver (3/19)…Tied a career-high three blocks vs. Indiana (3/15)…Tied a season-high 17 rebounds vs. Dallas (2/22)…Grabbed a career-high 10 offensive rebounds vs. Oklahoma City (11/8). 2012-13: Appeared in 81 games (all starts) averaging career-high 16.0 points, 9.6 rebounds, career-high 3.5 assists, career-high-tying 1.3 steals, 0.7 blocks and career-high 33.2 minutes per game…Among NBA league leaders, ranked 40th in scoring (16.0 ppg), 11th in rebounds (9.6 rpg), T39th in field goal percentage (.486) and T31st in steals per game (1.3 spg)…Led the team in scoring 25 times, in rebounds 49 times and in assists 12 times…Scored 10-plus points 70 times, 20-plus 19 times and 30-plus twice…Grabbed 10-plus rebounds 40 times and 15-plus eight times… Recorded one triple-double and a team-high 37 double-doubles – the most by a Piston since Grant Hill recorded 36 in 1997-98…His 37 double-doubles tied for ninth in the NBA…Had 15 games with 20-plus points and 10-plus rebounds…Led the Pistons in points (1,298), rebounds (777), defensive rebounds (541) and offensive rebounds (236) and steals (105) for the second consecutive season…Scored career-high 35 points at Toronto (12/19) and grabbed season-high 18 rebounds twice [at Philadelphia (11/14) and vs. Washington (2/13)]…Recorded his first career triple-double (21 points, 12 rebounds and career-high 11 assists) at Sacramento (11/7) – the first by a Piston since Chauncey Billups’ 20 points, 10 rebounds and 11 assists vs. Minnesota (2/20/04)…Also marked only the fifth triple-double by a Piston since 2000…Tied career-high four steals six times and career-high three blocks four times…Shot 50% or better from the field in 44-of-81 games… His 67 double-doubles over the last two seasons were the most in the Eastern Conference…Finished the season with 1,000-plus points and 600-plus rebounds for the second consecutive season joining Grant Hill (three times) and Otis Thorpe to record this feat in back-to-back seasons since 1994-95…Was one of only three players (David Lee, Al Horford) to average 16-plus points, 9.0-plus rebounds and 3.0-plus assists…Recorded eight consecutive double-doubles from 2/1 – 2/13 marking the most by a Piston since Grant Hill recorded 10 consecutive double-doubles from 3/1/96 – 3/17/96…His 35 points and 10 rebounds at Toronto (12/19) were the most points by a Pistons center since Rasheed Wallace’s 36 at Chicago (11/8/07)…He also became the first Piston to score 35 points and grab 10 rebounds since Grant Hill at Chicago (5/2/99)…His 35 points, 10 rebounds and 14 field goals at Toronto (12/19) were the first by a Piston since Adrian Dantley reached those marks vs. Cleveland (1/15/88)… Recorded his 3,000th career point at Cleveland (4/10), his 500th career assist vs. Toronto (3/29) and his 2,000th career rebound vs. Philadelphia (4/15)…Had his best offensive month of the season in April when he averaged 18.6 points, 9.5 rebounds and 3.8 assists while shooting 54% from the field and 81% from the free-throw line… Missed one game with a sore left ankle. 2011-12: Appeared in 66 games (all starts) averaging a careerhigh and team-leading 15.4 points (.521 FG, .739 FT), career-high 9.7 rebounds, 2.3 assists, 1.3 steals and 0.7 blocks in 31.5 minutes per game…Was the only Piston to play and start in all 66 games…Among NBA league leaders, ranked T36 in scoring (15.4 ppg), 11th in rebounds (9.7 rpg), 13th in field goal percentage (.521) and 28th in steals (1.3 spg)…Scored 10-plus points 52 times, 20-plus 18 times and 30-plus three times…Grabbed 10-plus rebounds 34 times, 15-plus six times and 20-plus once…Shot 50% or better from the field in 41-of-66 games…Recorded a team-leading 30 double-doubles – the most by a Piston since Ben Wallace had 34 in 2003-04…Had 10 games with 20-plus points and 10-plus rebounds…Ranked ninth in the NBA in double-doubles (30)…Led the Pistons in points (1,015), rebounds (637), defensive rebounds (398), offensive rebounds (239) and steals (83)…Became the fifth Piston since 1994-95 to finish the year with 1,000-plus points and 600-plus rebounds (Grant Hill, Otis Thorpe, Rasheed Wallace, Bison Dele)…His 637 rebounds ranked ninth in the NBA while his 239 offensive rebounds were third most…Ranked seventh in the NBA in offensive rebounds per game (3.6) and was one of five players to average 15.0-plus points and 3.5-plus offensive rebounds…Scored season-high 32 points twice [at Milwaukee (1/12) and at Sacramento (3/14)]…Also grabbed 16 rebounds at Milwaukee (1/12) to become the first Pistons center to score 30-plus points since Rasheed Wallace scored 36 at Chicago (11/8/07) and the first Pistons center to record 30-plus points and 10-plus rebounds since Cliff Robinson recorded 30 points and 10 rebounds at Orlando (11/26/01)…He joined Dennis Rodman and Grant Hill as the only Pistons to have 32-plus points and 16-plus rebounds in the last 22 years…Grabbed career-high 20 rebounds vs. Charlotte (2/29) to become the first Piston to have 20 rebounds in a game since Ben Wallace collected 21 vs. New Orleans (1/15/10)…Dished out career-high seven assists at Cleveland (2/21) and tied career-high four steals three times [at New York (1/31), vs. Cleveland (4/17) and vs. Philadelphia (4/26)]…His 83 steals were the second-most (DeMarcus Cousins) by a center in the NBA this season…Averaged 18.7 points (.517 FG, .730 FT), 10.7 rebounds and 2.4 assists in 33.7 minutes during the month of February – his best offensive month of the season… Improved his scoring average by 6.0 points (9.4 ppg to 15.4 ppg) from last season which marked the fifth largest increase in the NBA…Finished the year with the longest current streak in the NBA of consecutive games with five-plus rebounds (92)…Selected to Team Shaq as part of the BBVA Rising Stars Challenge at NBA All-Star 2012 in Orlando and tallied 19 points to go with 10 rebounds…Finished fifth in the NBA’s Most Improved Player Award voting. 2010-11: Appeared in 80 games (48 starts) as a rookie, averaging 9.4 points (.551 FG, .622 FT), a team-leading 7.5 rebounds, 1.3 assists, 1.2 steals and 0.6 blocks in 27.8 minutes per game…Among NBA league leaders ranked sixth in field goal percentage (.551) and T-32 in rebounds (7.5 rpg) and steals (1.2 spg)…Among NBA rookie leaders he ranked fifth in scoring (9.4 ppg), third in rebounds (7.5 rpg), ninth in assists (1.3 apg), first in field goal percentage (.551), fourth in free throw percentage (.622), first in steals (1.2 spg), fifth in blocks (0.6 bpg) and fifth in minutes (27.8 mpg)…In 48 starts, averaged 12.0 points, 9.1 rebounds, 1.6 assists, 1.4 steals and 0.7 blocks in 32.4 minutes per game…Scored 10-plus points 37 times and 20-plus points five times…Grabbed 10-plus rebounds a team-high 25 times and 15-plus rebounds three times…Led the Pistons in scoring four times, rebounds a team-high 41 times and assists once…Recorded a team-high 21 double-doubles (points/rebounds), the most double-doubles recorded by a Piston since Chauncey Billups (27 during the 2005-06 season)…Paced Detroit in offensive rebounds (248), defensive rebounds (353), total rebounds (601) and steals (93)… His 601 rebounds were the second-most rebounds by a Pistons rookie -- Terry Tyler recorded 648 during the 1978-79 season…Recorded a double-double in four consecutive games on two separate occasions (1/4-1/12 and 2/22-2/26) becoming the first Pistons rookie to record four in a row since Terry Tyler during the 1978-79 season…Scored a career-high 27 points (11-17 FG) along with 12 rebounds in 32 minutes at Indiana (2/23)…Grabbed a career-high 17 rebounds at New York (1/30) which was the most by a Pistons rookie since Oct. 17, 1978, when Terry Tyler grabbed 18…Dished out a career-high five assists three times [at OKC (3/11), vs. Toronto (3/16) and at Boston (4/3)]…Swiped a career-high four steals three times [vs. Dallas (1/17), vs. Minnesota (3/2) and at Washington (4/5)]…Blocked a career-high three shots vs. Washington (3/6)…Tallied a season-high 43 minutes three times [at Chicago (1/10), at Philadelphia (2/25) and at Washington (4/5)]…In 25 games after the All-Star break, Monroe averaged a double-double with 13.7 points and 10.0 rebounds, shooting 58.0% from the field...Was selected as a member of the Rookie Team as part of the 2011 T-Mobile Rookie Challenge and Youth Jam at NBA All-Star 2011 and tallied 14 points, eight rebounds, three assists and one steal…Averaged 9.6 points per game and shot 55.9% from the field in home games compared to 9.2 points per game and 54.3% from the field in road games…Enjoyed the best month of his rookie campaign in March where he averaged 13.5 points (.581 FG, .646 FT), 9.2 rebounds, 2.0 assists and 1.6 steals in 32.5 minutes per game…DNP-CD twice. Selected by Detroit in the first round (#7 overall) of the 2010 NBA Draft. Full name is Gregory Keith Monroe, Jr…Nickname is Moose….Son of Gregory Sr. and Norma Jean Monroe…Has one sister, Brittany…Grew up in New Orleans, LA area and fled to Houston with his mother and sister during high school when Hurricane Katrina hit the region…Family returned to New Orleans area one month following the hurricane – put a new roof on their house – and Greg helped rebuild his high school (Helen Cox HS) through his basketball prowess…In September 2006 the Times-Picayune of New Orleans included Monroe, then 16, on a short list of sports executives and athletes who had an impact on the area post-Katrina…That list also included New Orleans Hornets star Chris Paul…Active in the Detroit community, helped publicize the 2011 Pistons Care Telethon which raised more than $350,000 benefiting the Boys and Girls Clubs of Michigan…Helped distribute food to the less fortunate during multiple food distribution events…Provided 15 tickets to each Pistons home game during the 2010-11 season in a special ticket section called “Monroe’s County” which were donated to children’s charities in the metro Detroit area.